Place the chicken in a very large skillet and add enough water to cover. Over medium heat, bring the water to a gentle boil, reduce to maintain a simmer, and cook for 6 minutes. Turn the chicken and cook until almost cooked through, about 4 minutes. Remove the chicken from the skillet and set aside until cool enough to handle. Dice or shred the chicken and set aside. In a large saucepan or small stockpot over medium heat, melt the butter. Add the shallots and celery and cook, stirring occasionally, until tender, about 10 minutes. Stir in the cayenne, curry, dill, bullion, nutmeg, and pepper and cook for 1 minute. Stir in the flour and cook, stirring occasionally, for 2 minutes. Add the cider, sherry, and stock and cook, stirring, until the mixture is smooth and thickens, about 3 minutes. Stir in the chicken, cream, half and half, and apple. Bring to a boil, reduce to a simmer, and cook, stirring occasionally, for 10 minutes. Add salt and more pepper to taste. It's very rare when I stumble upon a recipe that needs no changing. My mom first made me this soup about eight years ago and it was love at first bite. It's creamy, curried, and perfectly balanced, with a little kick from cayenne, fresh bursts of apple, a rich nuttiness from dry sherry, and subtle hints of herbaceous dill. This is hands down my favorite soup, EVER. 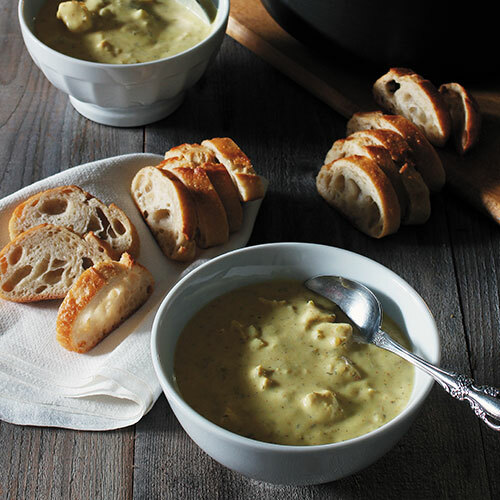 If you're looking for a first course for your New Years Eve dinner party, this soup will knock the socks off of your guests. Plus, we all need a rich indulgent last meal before we swear off fatty foods in the New Year, right?! Who needs New Year's resolutions anyway! I promise this soup will not disappoint.